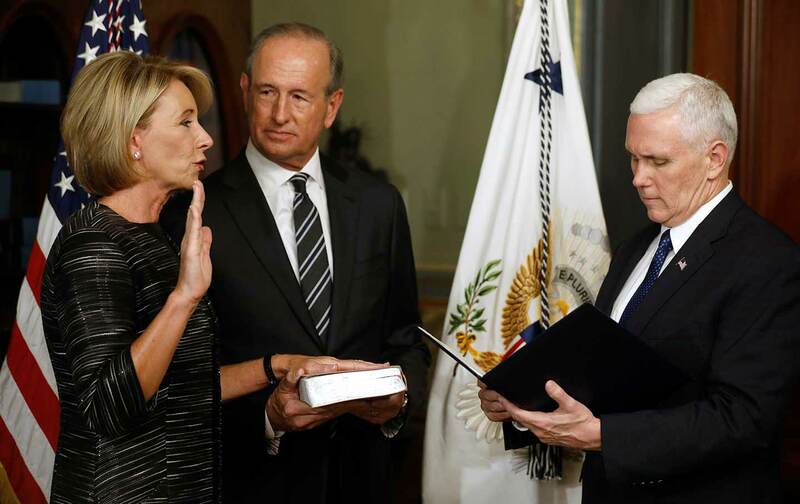 Betsy DeVos Has Been Confirmed. Now the Fight Really Begins. DeVos will have significant influence over how civil-rights protections for students are enforced, and how the for-profit college and student-loan industries are regulated. DeVos provoked a backlash unprecedented for an education-secretary nominee. As the vote neared, Senate offices received 1.5 million calls each day opposing her, according to the Los Angeles Times. Constituents showed up to protest en masse at senators’ offices across the country, from Omaha to Anchorage. The night before the vote, Democrats spoke against her on the Senate floor in a 24-hour streak. Saturday Night Live spoofed her. And while teachers unions and other public education advocates organized much of the pushback, even some charter school supporters, including her fellow billionaire philanthropist Eli Broad and the Massachusetts Charter Public School Association, joined the public opposition. There were several reasons for the outcry. DeVos was truly an exceptional nominee, having no experience in education outside of her advocacy for privatized education, which she’s acknowledged is religiously motivated. She made her own inexperience obvious in her confirmation hearing, appearing flagrantly unprepared and making a number of flubs that went viral online. (In a statement after the vote, Senator Al Franken called DeVos “the most incompetent cabinet-level appointee” he’d ever seen.) Her tangle of financial investments raised red flags for ethics watchdogs. And her unwillingness to offer even tepid support for traditional public schools put off residents of rural areas, where disinvestment would be particularly devastating. Though the wave of opposition to DeVos couldn’t block her confirmation, it did prove that there is a fierce, widespread constituency of support for public education, even in red and purple states. DeVos—her inexperience, her hard-line positions, her transparent embrace of pay-to-play politics—crystallized the debate about privatized education, a debate muddied in recent years by the fact that the Obama administration itself peddled a softer version. The question now is whether the anti-DeVos constituency can be mobilized in future education-policy debates, particularly at the state and local level where most K-12 policy is set. “No nominee has united Republicans and Democrats the way DeVos has,” Lily Eskelsen García, the president of the National Education Association, said in a statement after Tuesday’s vote. Thanks to the surge of activism against DeVos, the union was able to build up its roster of advocates to call on in the future. “We are going to watch what Betsy DeVos does. And we are going to hold her accountable for the actions and decisions she makes on behalf of the more than 50 million students in our nation’s public schools,” García said. Though DeVos’s advocacy and the outcry against her mostly revolved around K-12 education, DeVos will have limited power in that area. Testing and curriculum are largely set by the states, and federal funding accounts for less than 10 percent of public school budgets nationally. Last year Congress offloaded even more power to states via the Every Student Succeeds Act, which replaced No Child Left Behind. While DeVos and President Trump are both strong supporters of allowing parents to pay for private schools with public dollars, it’s not clear where they’ll get the $20 billion for Trump’s proposed voucher program, or whether Congress would get on board. One real area of concern is how DeVos will influence the department’s Office for Civil Rights, which is charged with ensuring equal access to education for students with disabilities, students of color, LGBT students, and other marginalized groups. DeVos will also have a considerable say in how the for-profit higher-education and student-loan industries are regulated. Under President Obama the Education Department tightened oversight on both, to protect student borrowers and ensure accountability at schools receiving federal money. It’s likely that the Education Department will adopt considerably more lax attitude to those industries under Trump—who himself operated a sham university. Trump has asked Jerry Falwell Jr., the evangelical president of a Christian university in Virginia, to head a task force on higher education; according to a spokesperson, his focus will be “overregulation and micromanagement.” As for DeVos, she avoided saying much specific about higher education during the confirmation process, aside from promising Senator Elizabeth Warren that she would be “vigilant.” So too will her opponents.